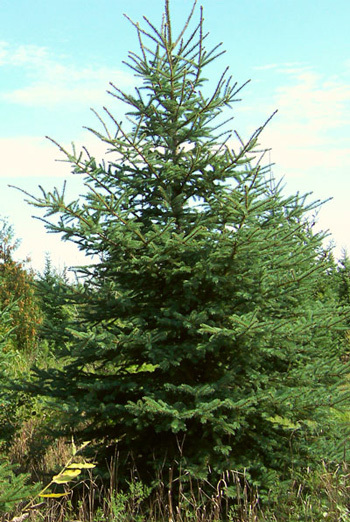 Balsam fir is an evergreen of the pine family, a spire-shaped tree that grows to 60 feet in height. The flattish needles are up to 1-1 1/2 inches long, in flattened sprays that are stalkless. Needles are rounded at the base, each with 2 lines beneath. The cones are 1 to 4 inches long and erect with purple and green scales, mostly twice as long as broad. The bark is smooth with numerous resin pockets. Cones mature in one season but drop their scales when ripe. The stems of the cones remain on the tree and fir cones are never found on the ground. The male and female flowers occur on branchlets of the previous year’s growth located on different parts of the same tree. The female cones are usually high; the male flowers hang on the lower part of the tree. Both are purplish in color when young. The leaves are sessile and attached singly. Another variety: the Native Americans used a balsam fir (Abies lasiocarpa), Shoshone name “Wungobe,” they made a tea from the needles and resinous blisters. They also called this variety Sweet Pine. They mixed grease with the resin to make fragrant hair-oil. There are 9 species of firs in the United States of the genus Abies. Found in moist woods. From Canada south through New England and along the mountains to West Virginia and Virginia; west through Ohio to northeastern Iowa and Michigan. Found in mountainous regions of Europe, Asia, and the Himalayas. 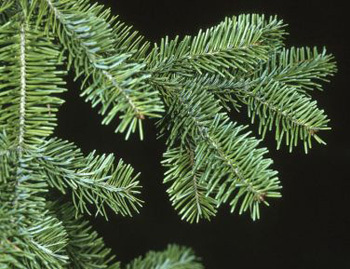 Balsam fir is collected by cutting the bark blisters or pockets in the wood, around July and August. Turpentine and resin are products of the balsam fir. The oleoresin is pale yellow to greenish yellow, transparent and pleasantly scented. The oleoresin is primarily used commercially as a sealing agent for mounting microscope slides. Used as a cream or ointment for piles and root-canal sealers. Native Americans applied the resin externally to treat burns, sores, bruises, sore muscles, and wounds. The leaf tea used for colds, cough, and asthma. Helps rheumatism, inflammation of the bladder, sciatica, neuralgia, epilepsy, erysipelas, erythema, colic, swollen inguinal glands, jaundice, iritis, dropsy, lumbago, worms, typhoid fever, bronchitis. Balsam fir, 1 oz., glycerin 4 oz., honey 4 oz. mixed together thouroughly. Resin may cause dermititis in some people.